Harry Anderson is knocking on the Posh first-team door. Posh are ready to unleash teenage sensation Harry Anderson over the Easter weekend. The 18 year-old attacker is hammering on the first-team door after a string of impressive reserve and training performances. Anderson scored in Tuesday’s 3-2 Development XI win over Bournemouth. 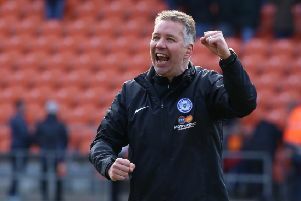 Anderson has been restricted to three substitute appearances for the senior side so far, but Posh boss Dave Robertson is his biggest fan and he’s preparing to utilise most of his 22-man squad in two League One matches spread over four days over Easter. “Harry is everything we look for in a Peterborough United player,” Robertson enthused. “He’s exciting, he’s strong, he’s quick, he’s talented and he has energy and desire to spare. “He also scores goals and he scored another cracker against Bournemouth. When you have that amount of ability it doesn’t matter how old you are. “It’s getting harder to avoid picking him and he will be in contention for a start over the Easter weekend along with many other players. “I have 22 players desperate to be involved over Easter and many of them will be. “I would imagine every team will be utilising a lot of players over the next two games. “I am lucky that I have so much depth in the squad especially after signing three loan players on deadline day. “The new players have come to play and Luke Williams showed what he can do in the first-team last weekend while Alan Sheehan and James Pearson delivered strong displays in the Development game this week. “One of the good things about my squad now is that the opposition won’t know who I will pick. “Marcus Maddison was also impressive in the reserves this week as was David Norris so I have many very good options. Norris and Aaron Mclean also scored for the Posh Development XI against Bournemouth.